Now onto the answers for the April 2014 Locate the Object using the SLOB (Same-Lingual, Opposite-Buccal) rule. 3) Determine what direction the metallic restoration appears to have moved in relation to the distal surface of the canine = distal. (moving from the premolar periapical to the canine/lateral incisor periapical radiograph). 4) Use the acronym. The unknown object moved in the OPPOSITE direction as the radiograph. The acronym states that opposite is buccal, so the metallic restoration is on the buccal surface of the canine. 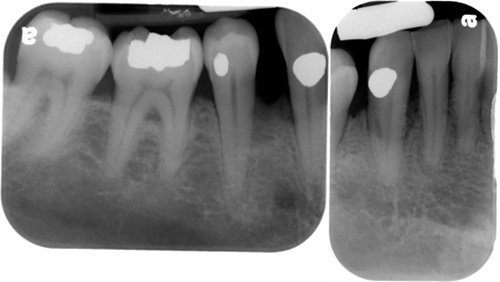 3) Determine what direction the broken endodontic file (orange arrow) appears to have moved in relation to the other endodontically treated root of the first molar = mesial. (moving from the molar periapical to the premolar periapical radiograph). 4) Use the acronym. The unknown object moved in the SAME direction as the radiograph. The acronym states that same is lingual, so the broken endodontic file is in the lingual root of the first molar. Another case will be coming next month. If you have any questions or comments, please leave them below. Thanks and enjoy!